Sir Martin Gilbert was born in London in 1936 to Jewish parents, Peter and Miriam Gilbert whose own parents came as refugees from Czarist Russia. 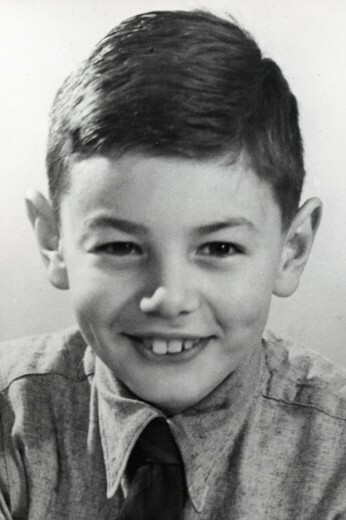 In 1939 when the Second World War broke out, as part of a British government scheme to move children from German bombardment, he was sent with his parents to Cornwall. 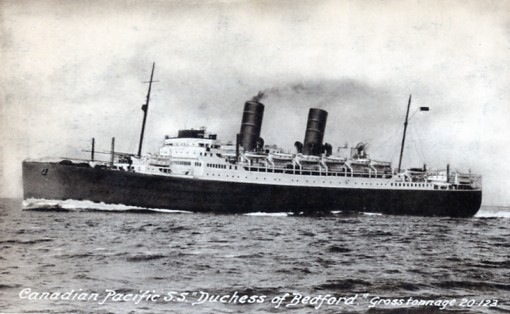 In the spring of 1940, Martin was evacuated with thousands of children to safety in Canada, and travelled with an aunt and her three children on The Duchess of Bedford: he was three and a half years old. 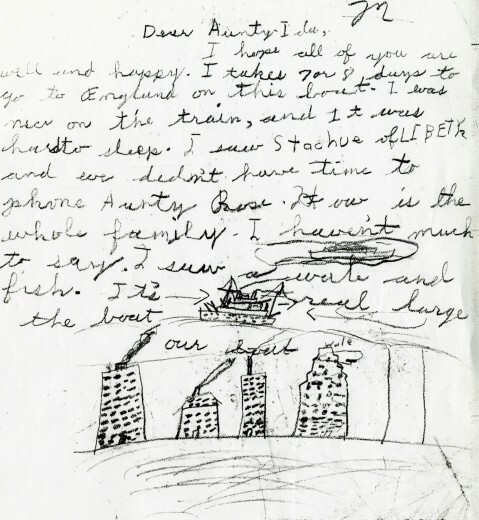 Back in London in 1944, Martin, his parents and a new baby sister were again evacuated, to Wales, where they were when the war ended. 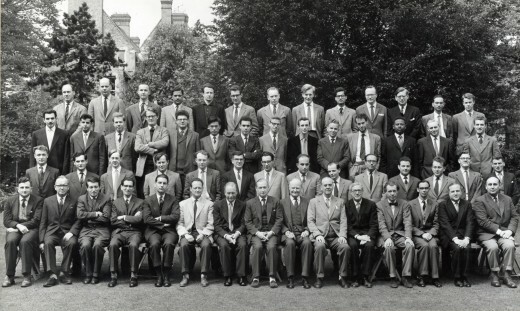 Highgate School, Martin, front row right side in dark jacket and glasses. In 2014, this part of the school behind the boys became the Sir Martin Gilbert Library. 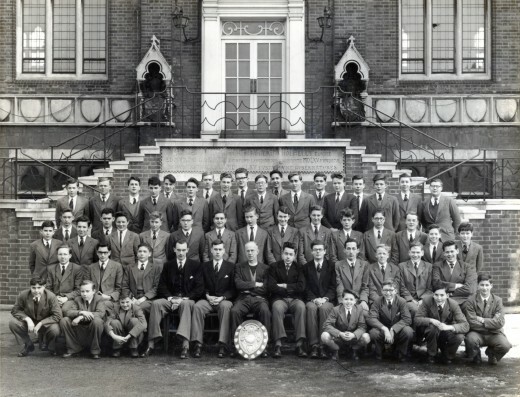 I was fortunate while a schoolboy in London, Immediately after the Second World War, to have been encouraged by my teachers to settle down in the corner with books that were not part of the examination syllabus. The master concerned then got me to read a worthy but dull book on the French revolution by an author (whose name I had better not recall) to show there were different ways of writing about the past. Following Carlyle, I was settled down with Motley’s Rise of the Dutch Republic where, again, the vivid historical narrative was enhanced by graphic writing, as well as by a strong theme, the defeat of tyranny by national self- assertion. Poetry written around historical events also made a great impression on me in those early years, with the result that, to this day, I have found inspiration in reading aloud particular poems set at specific moments in history: from the traditionally English schoolboy’s recitation of Byron’s description of Brussels on the eve of the battle of Waterloo from Child Harold, to Siegfried Sassoon’s stark warning of the future of air power in his poem Thoughts in 1932, when he forecast ‘fear will be synonymous with flight. Thirty years ago I corresponded with Siegfried Sassoon about this poem and this year I reproduced it in full in volume one of my History of the Twentieth Century. I have also been much influenced by the writings of Jonathan Swift, in particular his satires while never forgetting his own admonition in his preface to The Battle of The Books: Satire is a sort of glass, wherein observers do generally discover everybody’s face but their own.